As a leader in sustainable design, Mithun has been practicing design to support human health and well-being for a decade. Mithun’s Design for Health initiative explores partnerships to increase the systematic consideration of health within the design and construction of our projects. Real estate, design, development, planning and policy play a significant role in individual and community health—accounting for 40-60% of what determines length and quality of life. Said simply, place is a primary determinant of health. For example, we know that healthy design principles can result in improved respiratory health, reduced tenant turnover, and support behavioral changes necessary to achieve high energy and water efficiency performance. Establishing a cycle of local food production on-site and creating a series of varied and connected open spaces encourages a healthy lifestyle of engagement with the natural world. In addition, a home free of contaminants such as lead paint, asbestos, and allergens reduces health complications, missed school days and expenses for residents. Workplace: 53% human resource executives identify health as a major factor on lost productivity, 35% owners address health in design/building. Ability to attract new talent and lower healthcare costs are also cited as factors in decisions on buildings. Education: 17% higher education owners and 3% K‐12 school owners address health in design/building. Residential: 11% owners address health in design/building. The 2015 Enterprise Green Communities Criteria requires Health Credits to be addressed for all affordable housing receiving tax credit funding in 20 states plus voluntary participation of residential developers. As the market perceptions evolve, a variety of new tools for healthy design have also emerged, including a USGBC LEED pilot credit, Enterprise Green Communities Criteria health criteria, and a new Health and Wellbeing Module for the Green Real Estate Sustainability Benchmark (GRESB)—a global benchmark system assessing sustainability and health performance of real estate portfolios. Others have been used for several years, including the Active Design Guidelines, WELL certification system, and credits within SITES. As a result of the Rockefeller Foundation’s Resilient Cities program, many cities are exploring resilient strategies in their communities, which also includes an understanding of the role of the built environment on health. This activity represents a groundswell of interest in and support for health promoting design and real estate. Through our work and thought leadership, we advocate for an intentional, data-driven approach to healthy design. Ultimately, we see this as an opportunity to apply evidence-based strategies and research to the creation of beautiful, inspiring, and healthy places. Because of our leadership with Health Impact Assessments on projects like the Mariposa Healthy Living Initiative, a 17-acre TOD district in Denver centered around health, Mithun has been invited to team with the Green Health Partnership (GHP), a collaboration between the US Green Building Council and University of Virginia School of Medicine supported by the Robert Wood Johnson Foundation. The purpose of this collaboration is to catalyze demand for healthy places and practices throughout the design and development industries. One avenue is the new LEED v4 BD+C pilot credit for an Integrative Process for Health Promotion. We are actively working with clients, USGBC, and the University of Virginia School of Medicine to beta test this pilot credit. It takes an integrative approach to the consideration of user health and wellbeing throughout the project—from initial conceptual conversations through construction. 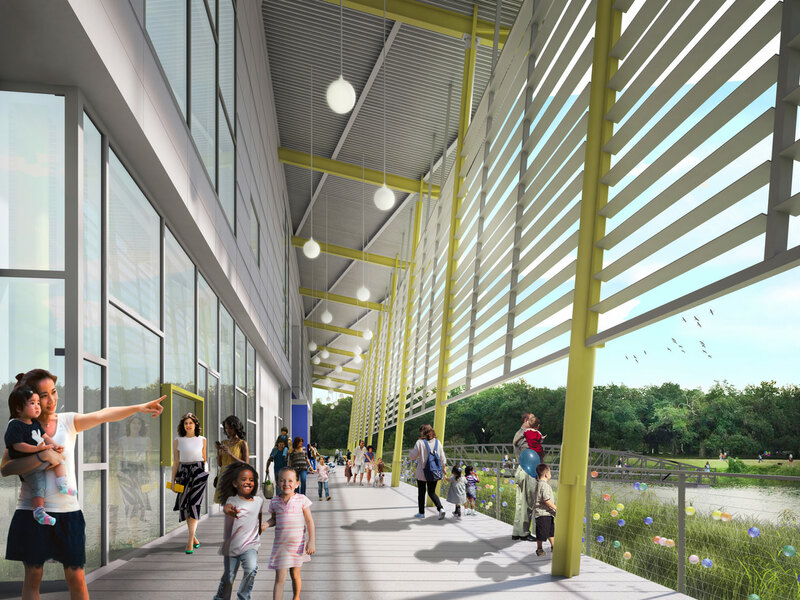 Our experience on projects like Chatham University Eden Hall Campus, Louisiana Children’s Museum, and Perot Family Offices teaches us that an integrative design approach helps to consider the intersections between multiple issues and identify areas of highest impact. Mithun supports our clients by using a health lens to articulate quality of life benefits of projects, to translate issues across sectors, and to overcome development limitations by building partnerships. We connect with the community and potential users by mitigating identified issues and providing a clear alternative to conventional development. Data-driven tools like Health Impact Assessments, user surveys, and Pedestrian Environmental Quality Index combined with engagement to learn about lived experience, help us gain a nuanced understanding of the project’s users and shape project goals. Through the Green Health Partnership, we are also working to advance collaboration between the public health sector, design and development. Whether it be accessing the public health evidence base or applying design thinking, we believe the best outcomes for health and well-being will come through collaboration amongst these fields at the project level. In 2005, we were fortunate to design the Breathe Easy Homes at High Point, a sustainable mixed-income revitalization in West Seattle. These homes were a pilot program with the Seattle Housing Authority, the University of Washington School of Public Health, Neighborhood House, Public Health – Seattle and King County, and the American Lung Association of Washington, designed specifically to eliminate asthma triggers for children and families. The results were dramatic and show the measurable financial and public health benefits that ambitious goals and a thorough design process can achieve. Specific design features and outreach resulted in a 67% decrease in emergency room and urgent care visits of asthma-affected residents. This project was one of the first in the country to design specifically for improved indoor air quality and was used to inform the development of the Enterprise Green Communities Criteria for sustainable housing. Looking toward the future, we hope these exemplars become standard in the industry, as we forge intentional partnerships between public health and design, and between research and practice.